This Winter Wonderland offer is for a family of 2 adults and 2 children , so make sure you BOOK ONLINE NOW to avoid the diappointment of missing out on this magical Lapland offer. We fly to Enontekio airport, from where this magical day break takes you deep within the Arctic landscapes. Our all-inclusive price includes the protective warmth of a thermal suit and boots (essential in a region where the average December temperatures range between — 7C and — 35C) but please ensure that you bring additional scarves, hats and gloves. You can take your pick from a wide range of activities. Enjoy a sled journey, being drawn by an eager team of huskies, and an altogether calmer reindeer sleigh trip. The day break also includes a snowmobile trip when adults with a full UK driving licence have the opportunity to drive through the silent snowscapes (children pulled in a sleigh behind guide). All major activities take place on a frozen lake or river. 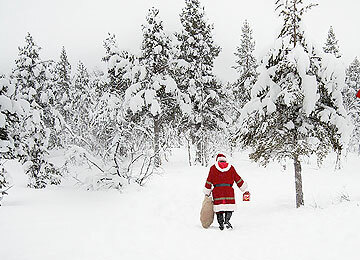 As well as all the activities detailed above, there will be time to play in the snow, giving children (and parents too!) the chance to enjoy tobogganing, snowman-making and snowball fights! A warming two-course lunch is included in the price of your day break. The highlight of the day arrives when you venture into the snow-clad surroundings in the hope of finding the hidden log cabin where Santa sometimes stays at this time of the year. After a magical journey across a frozen river, each family will enjoy a private visit with Santa, who will find the time to talk to each child about their Christmas wishes. Any departure airports with a s symbol is an offer.